There is something exhilarating about listening to music that's both unpredictable and comfortable. You think you know what kind of music a band likes to perform and they add just enough style, flair, and substance to keep listeners entertained for hours. 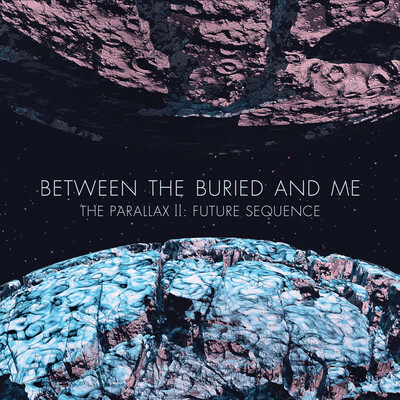 Such is the experience I just on the maiden spin of Between the Buried and Me's brand new album "The Parallax II: Future Sequence." This album has been highly anticipated since just after part I of "The Parallax" was released as an EP in 2010. That disc hinted at what was to come and showed great progress from the band. Its three tracks totaled more than 30 minutes of music. "The Parallax II" gives us nine tracks worth well over an hour of great tunes. Nothing on this disc is your standard fare from melodic-tech-prog metal which is refreshing in many ways. First, what I hinted about earlier is that the band string together complex melodies that do not rob the music of its soul, making for an unpredictable listening experience. Just when you think you have a track figured out as a laid-back melodic piece, or a neck-breaking shred metal song (or vice versa), the track reveals more of its true nature by introducing a different style. This change of pace, which happens often throughout the album, is not so drastic that it snaps your neck and leaves you wondering what the heck just happened, because more or less, you knew it was coming. The band hints at these moments just enough to warn you. It takes real skill to pull off this kind of tech. Luckily BTBAM have skill in spades. Plentiful jazzy melodies are scattered throughout the album, along with clean, reflective vocals. The vocal style moves back and forth from cleans to throat-shredding growls often. Once again, these guys deliver talent in the vocal department. You know instantly who you are listening to because no other vocalist in metal sounds quite like Tommy Giles Rogers. Another item of note about the music is that the keyboards bring spacey melodies to light just long enough to arouse interest, but not so long as to become overbearing. The bass on this album is well-played and easy to pick out from the metal carnage. It often sounds like a fretless bass, though I could not find any information confirming this. You have to hear it to understand its place in the music. "The Parallax II: Future Sequence" was worth the wait. This is a great album that is a must own for fans of progressive metal in general and for fans of BTBAM. The track below is available for free download at Soundcloud. Give it a listen and be impressed. As always, thanks for reading!